The Gathering Place first meal is their “Breakfast” which is not at 7 am or 8 am or 9 am but 10 am which is ridiculous and inhuman. The Gathering Places last meal is from 4 pm to 5 pm. 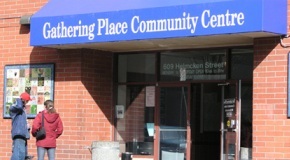 So the Gathering Place expect the homeless to last 15 hours on one meal, which is cruel and inhuman. Can Rennie Keates last 15 hours on one meal? If Rennie Keates is reasonable and is does not just come to work to get her pay check then she should look at what Carngie Center does which is to offer breakfast at 9 am. Plus Carnigie Center has supper until 8 pm. We ask you which is more human? Again we ask Rennie Keates to start breakfast at either 8 am or at the lastest 9 am and stop causing the homeless to starve for 15 hours daily. Contact the Rennie Keates who is the director of the Gathering Place and ask her to stop making the homeless starve for over a half day on a daily basis.